If you want to use this Charger in other countries which are not use category A plug, please make sure the adapter you use with enough power capacity or make sure the devices are low power need. For example, most of the power adapter 660W Max, at 110V, 1380W Max at 230V, but our travel charger are much powerful, if you use a high power hair dryer on our travel charger converted by an adapter in EU countries, the travel charger will broke, but if you use hair dryer(under 660W) on our travel Charger directly to AC power will work well. This Portable Power Strip Travel USB Charger is exclusive for business trips and vacations. Due to Hotel rooms, airport terminals, and coffee shops never seem to have enough power outlets to handle all your devices at once, such as cell phone iPad power bank, laptops etc. equipped with 4 USB ports and 1 Universal socket provide an idea solution for these condition. Even in some case the socket of the hotel is far away from your electronic devices; featuring with 1.5meter/5ft power cord is a perfect extension for you. In addition, the power cord is wraparound design make it easy to pack and storage. The universal power outlets are with built-in socket protective cover inside the socket to prevent finger from touching the conductor. 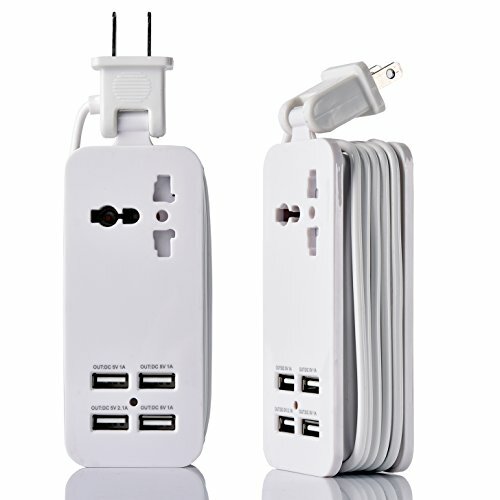 Universal socket +4 USB port is a perfect power solution for your electronic devices. Wide range input voltage from 100v to 240v is ideal for international travel. Wraparound power cord design for easy storage, it is ultra compact to fit into luggage and briefcases, convenience for business trips and vacations. Due to Hotel rooms, airport terminals, and coffee shops never seem to have enough power outlets to handle all your devices at once, such as cell phone iPad power bank, laptops etc. 1.5 meter/5ft power cord provides a flexible way for extension. The FLAT PLUG only support to be used in these countries: like United States, Canada, China, Japan, Brazil, Thailand, Philippine, Mexico, Nicaragua, El Salvador, Honduras, Nicaragua, Costa Ric, Panama, Haiti, Dominican Rep, Columbia, Venezuela, Ecuador, Peru, Boliviaand etc. If you have any questions about this product by ETPocket, contact us by completing and submitting the form below. If you are looking for a specif part number, please include it with your message.